Join the Mental/Behavioral Health COI for a discussion of minority mental health with Sergio Aguilar-Gaxiola, M.D., Ph.D., Professor of Clinical Internal Medicine, University of California, Davis, School of Medicine, on September 13 at 2:00 p.m. EDT. See what's new in the Toolbox online this month. Included are several bale handling devices and large-scale vegetable production aids. Please check us out on Facebook to stay abreast of our activities and recent fabrications: http://www.facebook.com/agrabilityinga. Indiana AgrAbility has launched its new website at www.breakingnewground.info. The site features an updated design and pages dedicated to news, resources, and information on such topics as available services, eligibility, and project partners. Amber Wolfe has also made several visits and has given short speaking presentations on AgrAbility and the Breaking New Ground Resource Center at several Indiana county fairs throughout the month of July. 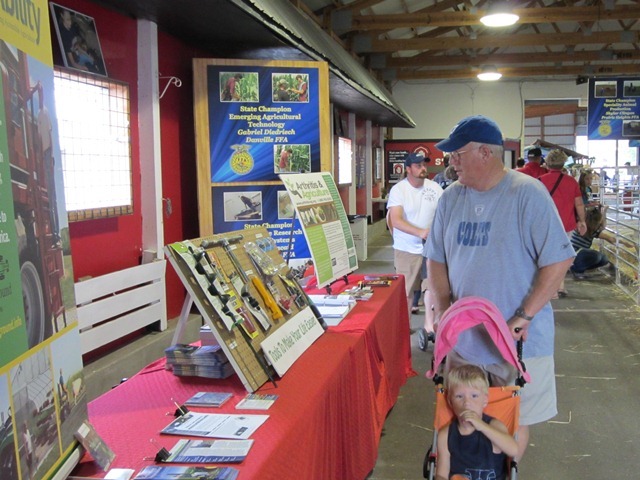 Despite the hot, humid weather, Carl Jenkins has attended and set up a display for Indiana AgrAbility/Breaking New Ground at the Perry County Fair and Crawford County Fair, and he plans to attend Scott County Fair, Harrison County Fair, and Jackson County Fair. 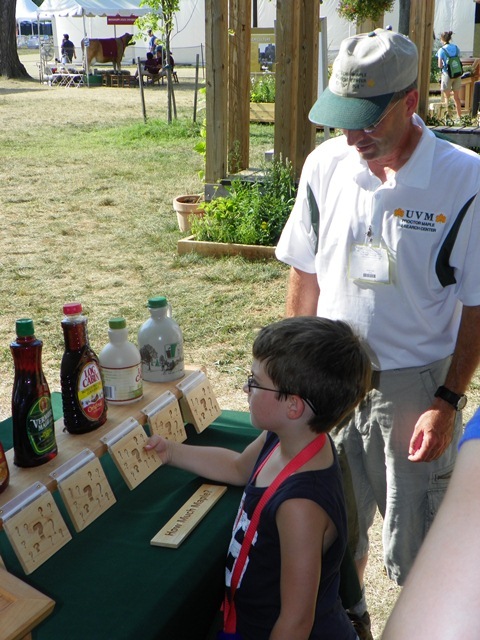 Linda Tarr has been working at local fairs in Southern Indiana to raise awareness for the AgrAbility program. Kansas AgrAbility and Kansas Farmers Union hosted farm tours for veterans on June 30 in Lyon County and July 31 in Johnson and Douglas Counties. The tours are part of a multi-state collaboration with the Center for Rural Affairs in Nebraska, Farmers Union organizations, and AgrAbility projects in Nebraska, Kansas, Colorado, and Missouri. Kansas AgrAbility exhibited at the 3i Farm Show in Dodge City, Kansas, July 12-14 with K-State's College of Agriculture and at the Four State Farm Show in Pittsburg, Kansas, July 20-22 with Southeast Kansas Independent Living and Assistive Technology for Kansans. Using Adobe Connect web conferencing, Willard Downs and Karen Funkenbusch, University of Missouri Extension, provided an AgrAbility update to CAFNR agricultural systems management and MU regional extension faculty members. Missouri schools are gearing up to start in a couple of weeks and with that said the Missouri FFA Executive Secretary sent an email on behalf of the Missouri AgrAbility Program to all Missouri FFA Advisors alerting them about potential uses of the National AgrAbility DVD, AgrAbility: It's About Hope. Doctor of Physical Therapy students at Langston University participated in a two-day course presented by Oklahoma AgrAbility staff focused on supporting farmers and ranchers during their rehabilitation process and on the identification of appropriate assistive technology devices and work modifications. Oklahoma AgrAbility staff attended the 2012 RESNA Conference in Baltimore, Maryland. Oklahoma AgrAbility also had a presence at the OSU Animal Science Big 3 Field Days, the OK Career Tech Family & Consumer Sciences New Teacher Training, and the State Oklahoma Home and Community Education meeting. Arthritis Foundation exercise classes were held by OK Cooperative Extension Educators (OCES) and AgrAbility staff in Payne, Jefferson, and Seminole Counties, reaching over 100 participants. Vermont AgrAbility PI George Cook accepted the president's gavel for the International Society for Agricultural Safety & Health (ISASH) for the coming year. 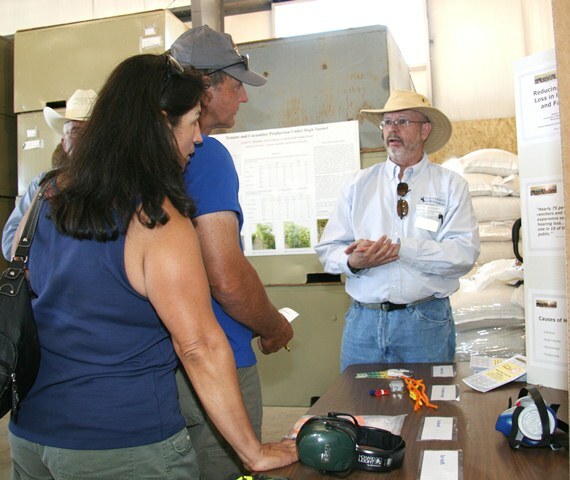 Wyoming AgrAbility shared information on reducing hearing loss in ranchers and farmers at the University of Wyoming's Agricultural Experiment Station field days in July. AgrAbility of Ohio is pleased to introduce a new staff member: Suzanna Windon is our new program assistant. Suzanna will be working on program marketing and daily office operations. Julie York resigned as Oklahoma AgrAbility program coordinator. She is returning to the classroom to teach Family & Consumer Sciences to 8th-12th grade students.